Jaguar XKR-S Convertible review | What Car? What is it? The Jaguar XKR-S coupe came out earlier this year and was a spiced-up version of the already-spicy XKR. This is the open-top model, which is powered by the same 542bhp 5.0-litre supercharged V8 and has the same modifications. The XKR-S Convertible has the same visual enhancements a more assertive chin spoiler being the most notable one and the same chassis changes, including stiffer springs, uprated steering, electronic changes to the shock absorbers, wider tyres and lighter wheels. All of this is in the aid of making it go quicker and dialling up the excitement. Its no mean feat for what is already one of the most thrilling soft-tops on the market. What's it like to drive? We had a brief go in a pre-production car in Los Angeles, which had arrived fresh from testing at the Nurburgring race track in Germany and had the battle scars to prove it. Nevertheless, it was representative enough for us to tell that it feels far more aggressive, faster and louder than the standard soft-top XKR. Its crisper through bends, too, although the pay-off is a stiffer, less settled ride that came through even on smooth American roads. It's loud, though; full throttle with the roof down is an intoxicating experience, and the way it gathers pace makes even an XKR feel tepid. The gearchange and engine responses feel more urgent, too, and it changes direction quicker and feels more agile. The noise and the ride quality, however make it less appealing when you just want to relax, make steady process and enjoy the fresh air. What's it like inside? The cabin is less changed than the exterior, but there was little wrong with it in the first place: this is a glamorous, well-made and practical sports car. The seats and driving position are superb, and so is the build quality. Mind you, the touch-screen sat-nav is starting to look and feel its age now it should be better considering how much the car costs. Should I buy one? A bigger question is whether it's ritzy enough to deserve a six-figure price? Or whether it may be a tad too lairy for what most customers need. The answer, we're afraid, seems to be 'no' to the first and 'yes' to the second. 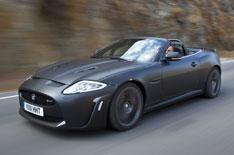 Sticking to a standard XKR Convertible, or even a 'normal' XK, seems to be the best solution.